Think of the Isle of Man TT in the ‘60s and you’ll almost certainly think of Manx Nortons. This particular example is a 1962/63 tuned by the great Francis Beart and ridden by Joe Dunphy in the 1965 Junior TT. Genuine Beart Nortons are very rare. Francis looked after many engines, but his attention to detail made his own bikes special. No customer could pay for the countless hours spent perfecting the cycle parts. Bolts were hollowed, steel was replaced with aluminium and drilled like Swiss cheese. Un-sprung weight reduction was his passion – and no plump riders! "The machine shows flecks of blue paint on many nuts, bolts, and other components identifying it as a 350 (a 500 had yellow daubs). Add to that the dull nickel finish; each clutch spring and its cup painted a different colour for exact re-assembly; the engine-turned alloy engine plates - all echoing a Beart maxim, 'If it looks right, chances are it'll go right'. 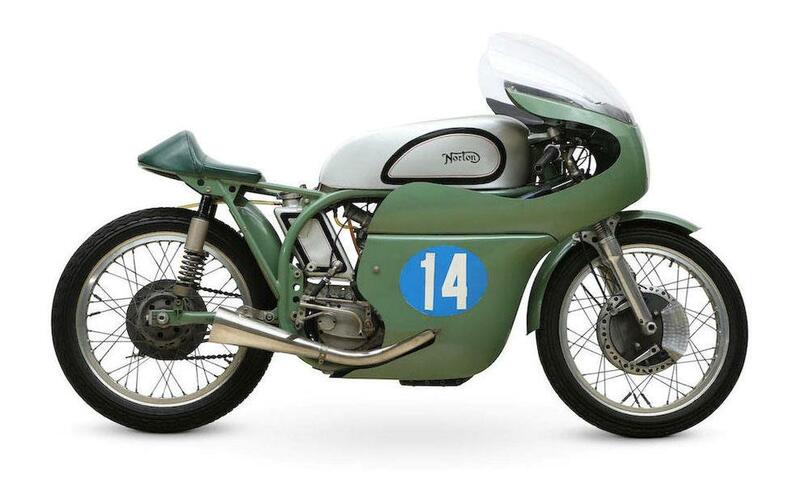 "The current vendor purchased the ex-Beart Manx at Bonhams' Las Vegas sale in January 2015 (Lot 155). Though fate conspired against it ever winning a deserved Manx GP, its history proved that this Beart Manx Norton certainly went as well as it looked."